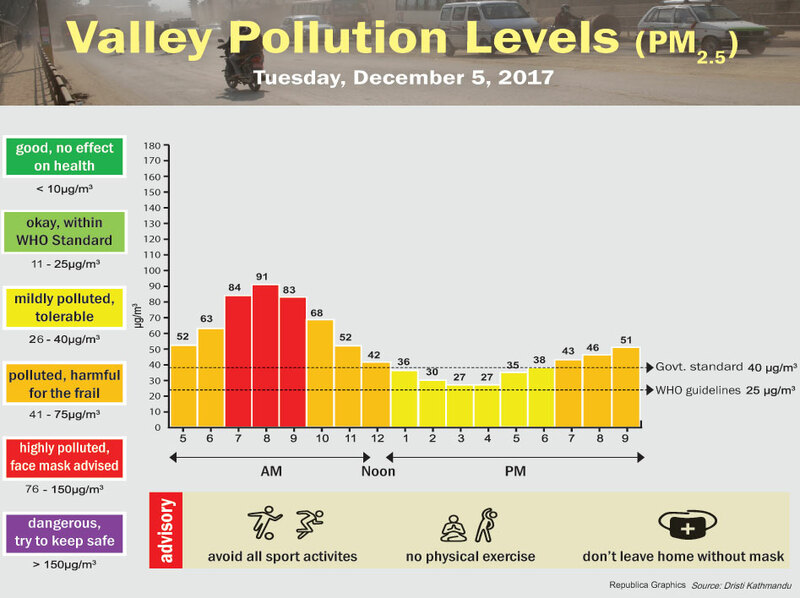 KATHMANDU, Dec 6: An estimated 75 percent of Nepal's population is exposed to unsafe levels of particulate matter air pollution. According to the 2016 Environment Performance Index (EPI) of Yale University in the US, nearly 75 percent of the population in Nepal is exposed to unsafe levels of particulate matter in the atmosphere. Air pollution in Kathmandu and in the tarai areas is particularly worrying. Major sources of air pollution are brick kilns, fume-spewing vehicles, street dust and the burning of household waste. Fume-spewing vehicles doubled in Kathmandu Valley last fiscal year, according to the Department of Transport Management. Most days of the year, except in the rainy seasons, the air quality of Kathmandu Valley hits dangerous levels -- up to five times the upper limit of the National Ambient Air Quality Standards guidelines, according to the Nepal Health Research Council (NHRC). Children are most vulnerable to the negative effects of air pollution. Urgent steps need to be taken to ensure clean air for children, including the establishment and strict implementation of the required regulatory framework for controlling the pollution and concrete measures to reduce the emission of pollutants. Meanwhile, issuing a statement from New York, UNICEF, the United Nations Children's Fund, has urged immediate action to reduce air pollution amid emerging evidence on how toxic air can affect brain development in young children in South Asia. “About 17 million babies under the age of one year breathe toxic air, and a majority live in South Asia,” says UNICEF. These babies live in areas where air pollution is at least six times higher than the international limits, causing them to breathe toxic air and potentially putting their brain development at risk, according to a new UNICEF paper released on Tuesday. More than three-quarters of the young children - 12 million - live in South Asia. Breathing in particulate air pollution can damage brain tissue, undermine cognitive development - with lifelong implications and setbacks, and harm lungs, triggering various diseases, the statement reads. Satellite imagery shows that South Asia has the largest proportion of babies living in the worst-affected areas, with 12.2 million babies residing where outdoor air pollution exceeds six times international limits set by the World Health Organization. The paper shows that air pollution, like inadequate nutrition and exposure to violence during the critical first 1,000 days of life, can impact early childhood development by affecting their growing brains: Ultrafine pollution particles are so small that they can enter the blood stream, travel to the brain, and damage the blood-brain barrier, which can cause neuro-inflammation. Some pollution particles, such as ultrafine magnetite, can enter the body through the olfactory nerves and the gut, and, due to their magnetic charge, can cause neurodegenerative diseases. Other types of pollution particles can damage areas in the brain that are critical for children's learning and development. The paper calls for reduced air pollution through investment in renewable sources of energy, affordable access to public transport; increased green spaces in urban areas; better waste management to prevent open burning of harmful chemicals and keeping of schools and health facilities away from polluted area.